As a full service contracting Company we appreciate all of your projects, large and small. We enjoy showing you all of the latest styles and trends as well as building on your pre–existing comforts of home. We look forward to meeting with you in your home so that we can get to know you as a person and as an individual. This way we can take note of what styles and fashions you and your family enjoy on a day to day basis. We think that all of this is a service above and beyond that of many others in the construction industry. When you add onto your home you want it to look as if it belongs, as if it were a part of the original plan. We pride ourselves on making floors, roof–lines, and exterior finishes appear seamless. We enjoy bringing rooms to life! We can take any room in your home and give it new style and flare. Whether you are looking for custom trim–work, a fresh paint job, new flooring, or built–ins we can help you with construction management. All of these things can turn any room into a room you can enjoy in a different way. Exterior finishes are a big part of many projects. We make old houses look like new homes. 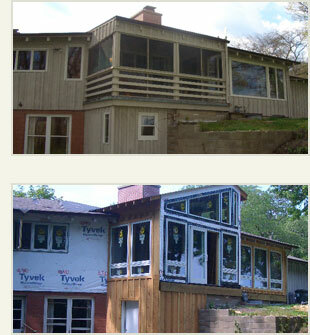 From new windows and doors to roofing and siding. Many, many more ideas...Just ask. The sky is the limit with bathrooms of any size. From Master Suites to guest bathrooms and even Half Baths, everyone wants these rooms to be comfortable and make a statement. You are involved in all phases of these projects. So they are sure to reflect your personality and taste. Many product lines to choose from. Beautiful cabinetry to fit any budget. Tile and stone work that will be envied. Mirrors that you design to fit your style and needs. Fixtures and finishes that are just right, because you pick them out. We’ll help you from step one to the end of your kitchen remodel.